Like many young men in Italy, the soccer players who put on their cleats for an afternoon match in this small Sicilian town dream of international stardom on the field. But for this group, having made it this far is already an achievement. Each member of the 25-man amateur squad ASD Mineo is African. They risked their lives to cross the sea from Libya in overcrowded boats last year, a journey that killed hundreds of others in shipwrecks, in the hope of finding political asylum. Their team – the first of its kind in Italy – was created and funded by the managers of the Mineo centre for asylum seekers, one of Europe’s largest such shelters. ASD Mineo, as the team is called, is registered in the lowest category of Italy’s official football pyramid, which groups 600 divisions and in which, in theory, any team can rise to the top of the league, or Serie A. The team is on track to advance to the next division in its first season. 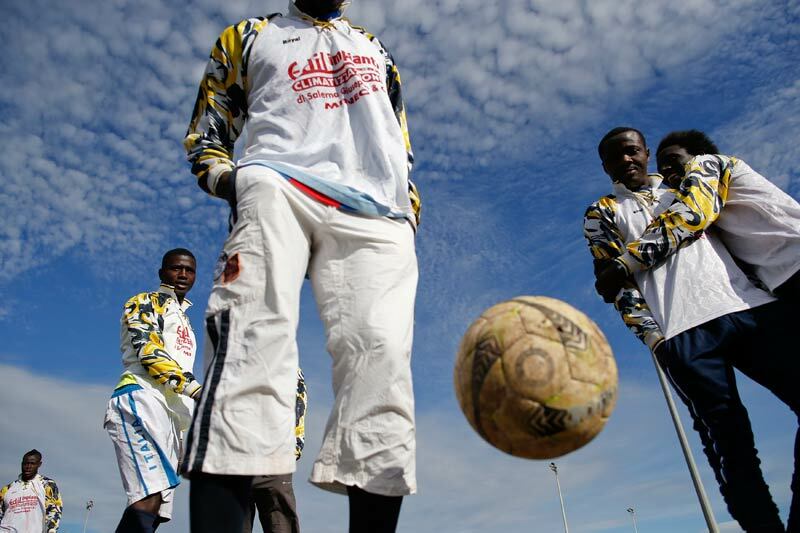 “We can make it all the way to Serie A,” 19-year-old Musa from Gambia said after defeating another – all-white – local team 4-0 on a recent Sunday. Like his teammates, Musa declined to give his full name for fear of reprisals against family members back home as he seeks political asylum. In this country of soccer fanatics, ASD Mineo has become a test of racial integration. Though many Sicilians criticise local, national and European authorities for failing to provide enough resources to cope with the influx of immigrants, ASD Mineo has not suffered public resentment. That’s not always the case at the national level, where racism has been a constant problem in football. Though top-flight teams include black and Muslim players, stadiums often echo with monkey chants. One of Italy’s best footballers, Mario Balotelli, a Sicilian-born son of Ghanaian immigrants who plays forward for AC Milan and Italy’s national team, has sometimes been on the receiving end. Some argue that the problem is made worse by immigration rules which make it difficult for those whose families come from abroad to be accepted as Italians. Balotelli, for example, was not able to gain citizenship until he was 18. 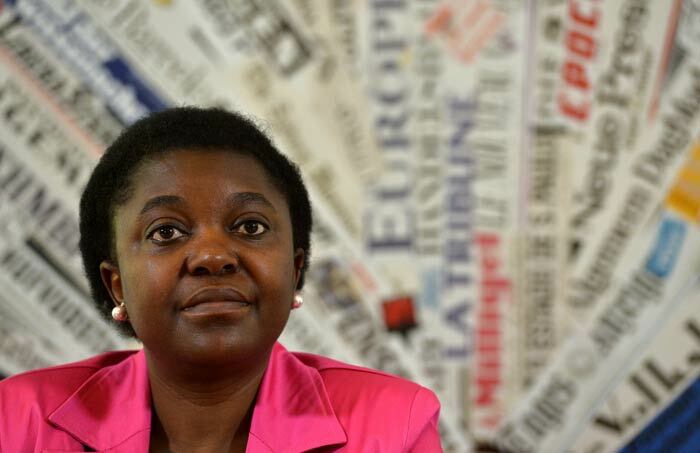 Italy’s first black government minister, Cecile Kyenge, has tried to introduce a law allowing anyone born on Italian soil to become a citizen. She herself has been a target of racists – likened to an orangutan and pelted with bananas in public. Sicily, an island that on a map looks like a ball about to be kicked by the Italian “boot”, has been used as a stepping stone to the European mainland for millennia by, among others, Phoenicians, Greeks and Arabs. Today it is a gateway for migrants and asylum seekers from as far away as India, Pakistan and the Syrian civil war. Most migrants come from Northern and sub-Saharan Africa. Italy has struggled to provide basic services to the 40 000 new arrivals last year amid its worst recession since World War Two. The asylum centre in Lampedusa, Sicily was badly overcrowded last year. A video showing migrants standing naked in the cold while being sprayed for scabies stirred outrage and prompted authorities to transfer them out in December. Many of the migrants ended up in the Mineo asylum centre, which sits in an isolated valley southwest of the smouldering, snow-capped Mount Etna volcano. Some 4 000 migrants from 40 nations occupy about 400 two-floor villas that once housed U.S. Navy personnel who worked at the nearby Sigonella NATO air base. There has been occasional trouble: in October, residents of the shelter blocked the two-lane highway that runs next to the centre, threw rocks at police and destroyed cars to call for faster asylum and temporary permit procedures. Many of the shelter’s residents had been waiting up to two years for documents needed to leave the camp and find work. Several of ASD Mineo’s soccer players have been waiting 10 months, though Italian guidelines say it should take between 45 days and six months to get through the asylum-request process. Nineteen-year-old Mohammad from Togo – a defensive player on the team – was orphaned at age 12. Both his parents died of infection after what he described as a black magic ritual in which he and his parents were cut with machetes. He survived with deep crisscrossing scars on his thighs. “In my village some people called me Balotelli, and then when I arrived in Italy they started calling me Balotelli,” says Mohammad, who sports a similar Mohawk haircut to the AC Milan star. The teenager says he left his village and, after crossing the Sahara desert, was stopped by police and imprisoned in Libya for not having legal travel documents. He managed to wrangle an exit from jail and get on a boat to Lampedusa. The idea of forming a soccer team was hatched by the shelter’s director Sebastiano Maccarrone after he watched residents’ pick-up games. He asked a former professional player and employee of the shelter to form a team of the best players. “Putting one team on the field was hard because there were so many good players to choose from,” saidGiuseppe Manzella, one of the two coaches. Those who made it got new soccer shoes and blue-and-white jerseys for games, and a red sweat suit. “America” is the nickname of 19-year-old Ghanaian Abdullahi, top scorer in the league with 18 goals in 14 games. He chose the nickname because “I love America and want to go there”. He did not disappoint, scoring two goals. ASD Mineo’s coaches say he is good enough to become a pro, and scouts from Catania’s Serie A team have showed an interest in him. After the game, the African and Italian players shook hands. Some embraced, and they posed for pictures, winners and losers both smiling, arms around each others’ shoulders.